Bengali Veg Moong Dal is most popular dal among Bengalis. 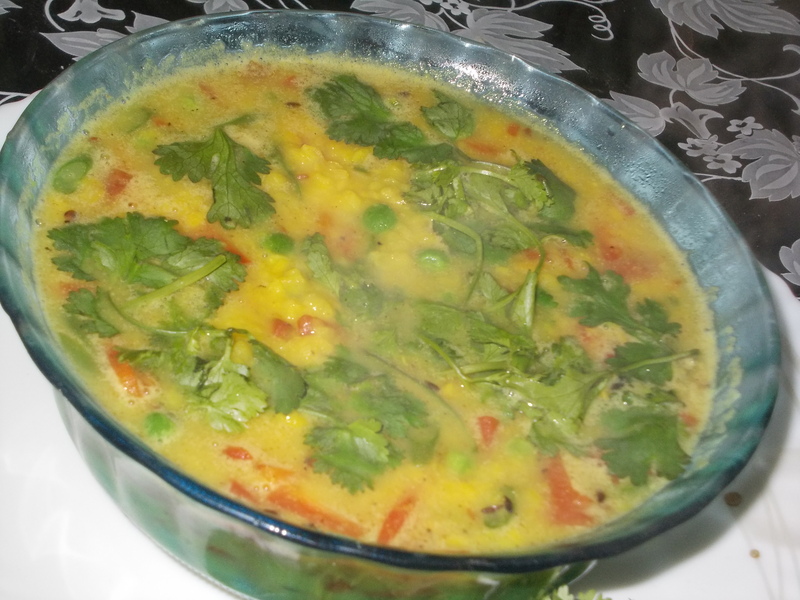 It is the combination of moong dal & vegetables. It is tasty & healthy too. Wash & boil the moong dal with 1 ½ cup of water, ½ tsp of salt, ½ tsp of turmeric powder. Keep aside. Heat oil in a pan. Add red dry chilli & cumin seeds & stir. Add all the vegetables & dal & stir well. Add ginger paste, tomato, salt, sugar, green peas, green chillies & more 1 cup of water. Add coriander leaves & ghee & remove from heat.